Hi everyone! I have another love-themed card to share with you today. I very much like the non-traditional colors on holiday cards. Don’t get me wrong, I love red and white or pink Valentine’s Day cards, but sometimes I just want to experiment and see if other colors would work well. For this project I went with light blue, green, pink and black. I think the card turned out lovely. What do you think? I started by stamping the black fence directly onto my card base. I love the adorable heart-shaped holes, they look so cute! 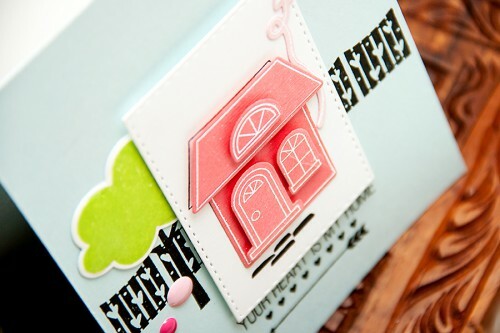 Next I die cut a rectangle out of white cardstock and “build” a house on top of it. I used lots of foam adhesive to create dimension on my project. 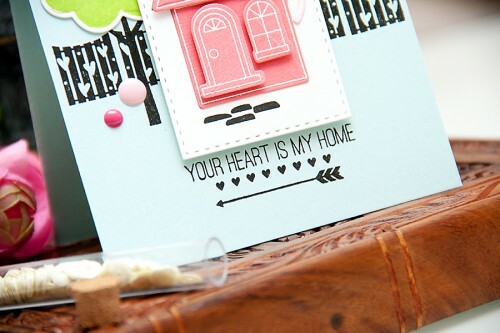 To frame the piece I also stamped a sentiment under the rectangle in black ink, added a few tiny hearts and an arrow. I just love that arrow image! I also added a tree as I felt my card needed an additional pop of color. 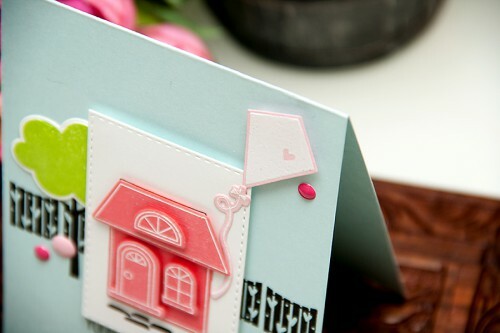 I stamped the bottom part directly onto the card base and added the die cut top part over it. To give this project a bit of a whimsical look I also added a light pink kite. I had it sitting on my table from a previous card I made and I didn’t want to throw it away, so I used it here. Cute:) I also like the hearts in the fence. Love the greeting too. Very Pretty! I love how you built your scene. 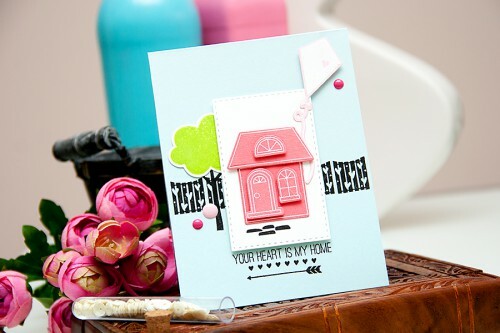 Beautiful card, love the house…the card is so cute and orginal. Wonderful and so cute. Love the details of you scene. TFS. My favorite is the heartbeat card too! Beautiful work! Love this beautiful scene, very cute with lovely pop of colors!! Love this little card. That house is too cute! 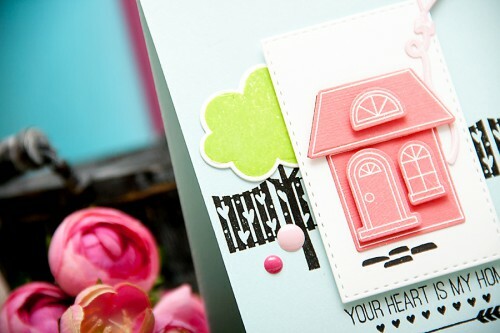 Very pretty card, love the design and stamps! Such gorgeous composition of the picture too!